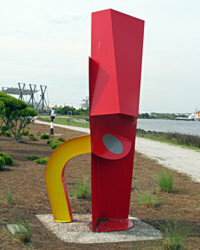 The winners are in for the Annual National Outdoor Sculpture Exhibition at North Charleston's Riverfront Park. Sculpture artists from across the nation applied to the fifth annual competition for up to $14,750 in honorariums and awards. Eleven sculptures were selected by the juror, Stuart Hordoner, Artistic Director of the Atlanta Contemporary Art Center. 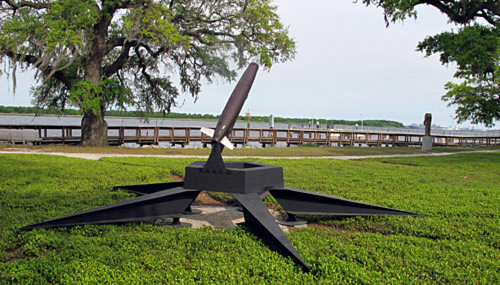 Once installed at the exhibition site, Hordoner then selected pieces to receive awards for best in show, second place, and honorable mention. The eleven sculptures selected for exhibition are by eleven artists from seven states. Division I includes ten sculptures that are anchored to a concrete pad or in the grass. Division II includes one sculpture that is secured to a concrete pedestal. 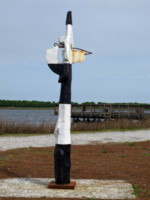 Sculpture sites are located throughout the picturesque Riverfront Park, at 1001 Everglades Avenue in North Charleston. The show will be on display until March 25, 2011.